Currently starring in GMA-7's 'Meant To Be' as one of its leading men, Addie Raj recently shared that Filipinos love him despite being a foreigner. Addie is of Indian descent and he told PEP.ph that, during his out-of-town shows and mall tours, he observed that his fans never made him feel out of place. When asked during the taping, the Kapuso star shared his gratitude to his supporters. "It feels good. I'm just happy that all the hard work are being paid off and I'm just really thankful for all the people supporting us." "They're not judging me for not being fluent in Tagalog and, of course, I'm a new actor and it's hard for me to come in the same level with anyone else." "And people are accepting me, I really appreciate that." Rumors say that Addie and his leading lady, Barbie Forteza, are an item. The actress once revealed that Addie texts her at 3 a.m. The Kapuso star shared how he admires Barbie's dedication. "I discovered a lot about Barbie, like I've said, I never imagine that it's so hard, the whole schedules. But I just find it amazing how she can do the work so easily, smile at every one." "She's lacking of sleep every time and retake and retake, but still, she's okay with it. In a snap of a second, she would be crying and then, cut, a minute, she's laughing." "Kaya I really have high respect for Barbie because she's really good with what she does. I hope I can be like that in the coming days." Meanwhile, he also shared that he's looking forward to creating a movie in the future. "Actually, that's one thing I'm looking forward to. When I started, I wanted to be an actor and the first thing in my mind was actually movies." "But it happened, but of course, Meant to Be might even be better than movie. But then, movie is one thing that I've always wanted to do and I hope I can try and have my first movie." Addie recalled the time when he was supposed to be a part of Metro Manila Film Fest entry 'Beauty and the Bestie'. When he learned of Director Wenn V. Deramas' death, Addie felt a tinge of regret. "But I had a problem. One day before the shoot, I also had a commercial and I had to choose between the movie and the commercial and I chose the commercial because in the movie, it was only a short role." "I apologized to him and he said, he'll give me a role in his next movie, but sadly, he passed away." The Kapuso star has moved on and is currently shining in his own teleserye. For those curious about his love life, Addie reveals that he is single for the time being. He also admitted that he is still a virgin despite his past long-term relationships. 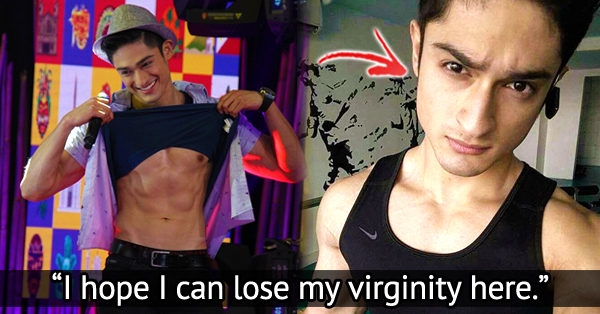 "I hope I can lose my virginity here," the actor joked.